At 35 years of age Harry was one of Eton Wick's oldest fatal casualties of the Great War. He was born November 17th 1883 and baptised the following January. Brother Fred was born in July 1885 and it was about this time that Edmond and Louisa Quarterman took their young family from King Stable Street in Eton and moved to number 3 Oak Villas, Boveney Newtown. Two more sons were born in 1886 and 1887 and were named Alfred and Lewis. An older boy, John, apparently joined the regular army and at the outbreak of war was serving in Hong Kong, where his two sons were attending school. Hostilities brought them all back to England and when the two lads John and William, aged 12 and 13 years, registered for the Eton Porny School on January 18th 1915, they had the unusual entry in the register as "Previous School, Hong Kong". By this time the family home was at Long Close, The Little Common, Eton Wick and John's young family went to live there with his parents and their family. At Long Close the family were pig farmers. Years later it was recorded that Tom Quarterman was living there with his mother and two sons. Perhaps Tom and John were one and the same. Certainly Harry had four brothers and one sister, Kate. He attended Eton Porny School from October 26th 1891 and left that school one month before his 13th birthday, in October 1896. Perhaps he also became a regular peacetime soldier, but the facts have not been established. The Parish Magazine did however report him as serving in the army before September 1914. In August 1914 the 1st Battalion Royal Berkshires was at Aldershot, attached to the 6th Brigade, 2nd Division. On August 13th they arrived in France and 10 days later saw their first action. Considerable fighting took place then, and again during the long retreat from Mons. Initially Battalion casualties were not heavy but during October and November 1914, they suffered substantial losses while fighting in the First Battle of Ypres. At this time it became necessary to commission senior N.C.O.s. in the field. During the 1915 spring fighting they lost a further 423 officers and men. In September they were engaged in the Battle of Loos, and although they succeeded in taking their designated objectives, the overwhelming enemy forces drove them back again. "there were hardly enough [troops] to cope with the enemy when eventually his front line was reached." The following year, in November, they were heavily engaged at Bourlon, and it was here that a company of men decided on "No Surrender" and died fighting. It was probably about this time that Harry was transferred to the 2nd Berkshires, 25th Brigade, 8th Division. American troops were beginning to arrive in Europe in the spring of 1918 and in an attempt to preempt their obvious influence on the war the Germans launched a massive 40-mile front attack, supported by 6,000 artillery guns, on March 21st of that year. Allied armies were forced to withdraw in the face of the onslaught. At midday on May 27th gas shells rained down on the four French and three British Divisions defending between the Ailette and Aisne rivers. The defenders were very tired as they faced 18 German Divisions. At 3.40 a.m. the following morning, German storm troops attacked and reached the Aisne across a carpet of annihilated allied soldiers. The 8th Division, which included the Berkshires, was one of the three British Divisions involved. It was here on May 27/28th that Harry was taken prisoner, but not until two months later was the first news of him available. Quarterman H. of Little Common, Eton Wick - Private in Royal Berkshire Regiment, missing since 27.5.18. "Memoriam" Quarterman -Harry, Private. In memory of our dear son and brother in the Royal Berkshire Regiment, reported as missing on May 27th 1918 and is now officially reported as "Died of Dysentery" on October 30th 1918, whilst a P.O.W. at Asfold in Germany, after 4 years of active service. Until we meet in the better land. Harry was married to Julia. He was 35 years old and is buried in the Sedan (St Charles) Communal Cemetery, French Military Extension - Grave No. 621. The cemetery is situated 11 miles south east of Charleville. All 50 British burials are of P.O.Ws. who died between April 9th and October 30th 1918, In Eton Wick, the War Memorial Committee deliberated on the eligibility of Harry Quarterman to be on the village memorial, because he had lived in Hanwell before the War. 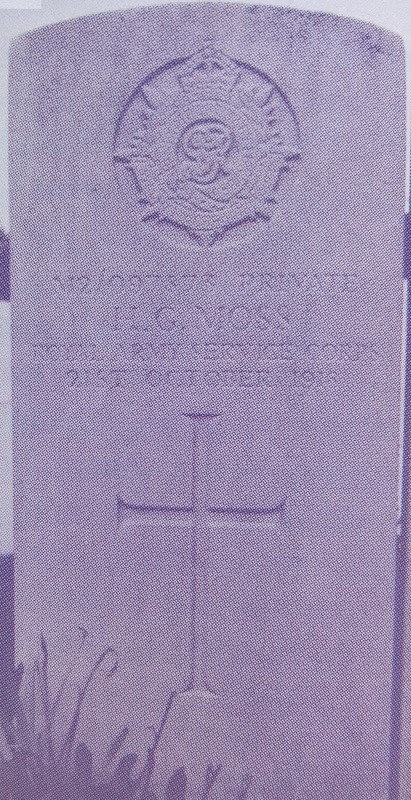 At the time of the memorial unveiling in March 1920 a decision had been taken to include Harry's name, and it appeared on the "Form of Service". Because of the late decision however, his name was inscribed at the foot of a panel on the memorial and not in its alphabetic order. His name was not included on the Eton Church Memorial Gates: the only Eton Wick omission. Harry's brothers lived in Eton Wick and Eton for the rest of their lives, and today relatives are still living in the village. Harry Quarterman: The Commonwealth War Graves Commission page. Harry Quarterman: The For King & Country page. Harry Quarterman: The Lives of the First World War page. Albert Stallwood was born in High Wycombe in 1892 and apparently spent most of his early years living in Langley. When he left school he first took employment at a local farm in Langley and later became a carman at Slough's G.W.R. station. He married Emily Edith King in 1914 and this was probably when he moved to Eton Wick. They set up their home at No. 13, Castle view Terrace, Victoria Road, Boveney, and on March 1st 1915 Harry Albert was born. The christening took place on September 5th 1915 and two months later, on December 11th Albert enlisted in Windsor for the Life Guards. The Life Guards, together with the Royal Horse Guards, constitute the prestigious Household Brigade: the soldiers of the Sovereign and as such they enjoyed a higher rate of pay than most other soldiers. Before joining the 2nd Battalion in the field Albert would have spent several months in training. The Brigade, meanwhile, was actively engaged on the continent, taking part in violent fighting during the Battle of Langemarck, 21st to 24th October 1914, when as dismounted troops they manned trenches between Zonnebeke and St. Julien; and at Gheluvelt from the 29th to 31st October, when they were forced back to Klein Zillebeke. At this time two squadrons of the Life Guards were wiped out. They were again in support at Hooge during the battle of Nonne Bosschen on November 11th 1914. The following year brought further heavy casualties in the trenches near the Ypres-Zonnebeke road, May 8th to 13th, during the second battle of Ypres, and in September 1915 the 3rd Cavalry Division was again pressed into action during the battle of Loos. Albert Stallwood was not involved in these early engagements but the survivors were. about to become his comrades and, when trained, he was surely going to be a replacement for one of the many casualties. During the 1916 Somme offensive, the Guards were kept in readiness behind the front line for a cavalry breakthrough which never came. Modern warfare with machine guns and trenches was not suitable for cavalry charges. By this stage of the war Trooper Stallwood would have been in the field with the 2nd Life Guards. The following year in the Battle of Arras the Household Cavalry were again ready to exploit a breakthrough but again the opportunity was denied them. By 1918 it had been decided to re-train the Household Brigade, as machine gunners. The 1st and 2nd Battalion Life Guards were to become the 1st and 2nd Battalions Guards Machine Gun Regiment. On March 10th 1918 they commenced their training at Etaples, on the Boulogne to Paris coast road. This was completed by the middle of May. On Whit Sunday, May 19th, when a fresh draft of 128 men had arrived, the great complex of hospital camps and training grounds of Etaples was subjected to a surprise Gotha bomber raid. It was 10 p.m. and the 2nd Battalion left their quarters, preferring to be in the open. 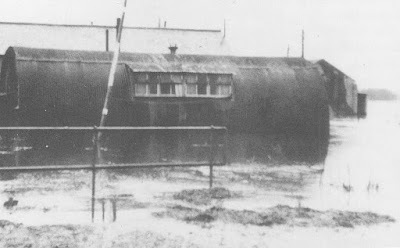 The 1st Battalion stayed in their tents. One hour later a single bomber returned and two of the 1st's four companies were obliterated. In all 43 soldiers were killed and 82 were wounded. The fatalities included Charles Godwin of Eton Wick, (1st Battalion) but Albert Stallwood, being in the 2nd Battalion, was unharmed. On May 23rd the 2nd Battalion re-entered the line, joining the IV Corps at Warloy while the 1st's went back to Arras. They were in action during fighting on the Hindenburg Line between September 12th and October 9th 1918. "Stallwood, Albert, husband of Mrs Stallwood of 13, Castle view Terrace, Boveney. "Trooper Life Guards (attached) Machine Gun Section died October 24th at 55 Casualty Clearing Station in France from wounds received in action." 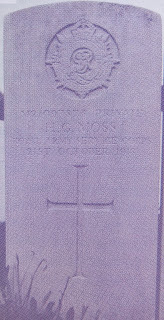 He was buried at Prémont British Cemetery, Plot 1, Row B. Grave No. 5. The cemetery is one mile S.E. of the village of Bohain and 12 miles N.N.E. of St Quentin. It contains 572 burials of the Great War, with 521 being soldiers from the U.K., seven Australians, six Canadian, one each from India and South Africa and 36 Germans. Albert was 26 years old and he left a widow with two children. Happily Emily married again, and to a former service friend of her late husband. As Mrs Thurston she continued to live at 13, Castle View Terrace for some years. Albert Stallwood is commemorated on the Eton Wick Memorial and on the Eton Church Memorial Gates. Albert Stallwood: The Commonwealth War Graves Commission page. Albert Stallwood: The For King & Country page. Albert Stallwood: The Lives of the First World War page. A small number of families continued to attend the services of the Congregationalists, and as late as 1877 the Minutes of the Windsor Church described Eton Wick as 'flourishing'. But in that year a new personality, who was to have a decided influence on the lives of a great number of people, arrived in the village. This was young Mrs Tough, who until recently had been Annie Moore of Rotherhithe, London. She came as a young bride to live at Bell Farm. Annie was an active Primitive Methodist and within a very short time had taken over the Congregationalist meetings and was conducting her own services and Sunday School in the Iron Room and cottages. There is no doubt that Mrs Tough was successful in attracting families to her services and children to the Sunday School. Indeed, she was so successful that she soon incurred the displeasure of the new curate whose area of special responsibility ' included Eton Wick. In November, 1878, he wrote a short letter to Mrs Tough stating very clearly that he would be very obliged if she would kindly not encourage the children to attend chapel Sunday School, as he had forbidden them to attend it and he wished them to attend the Church Sunday School only. Mrs Tough sent a very spirited reply in which she assured the curate that she would do all in her power to urge the children to come to her meetings. As she explained, she had already made 'concessions to the Church in as much as chapel Sunday School was held at an inconvenient hour so as not to coincide with any church services, and parents and children were quite free to attend both. 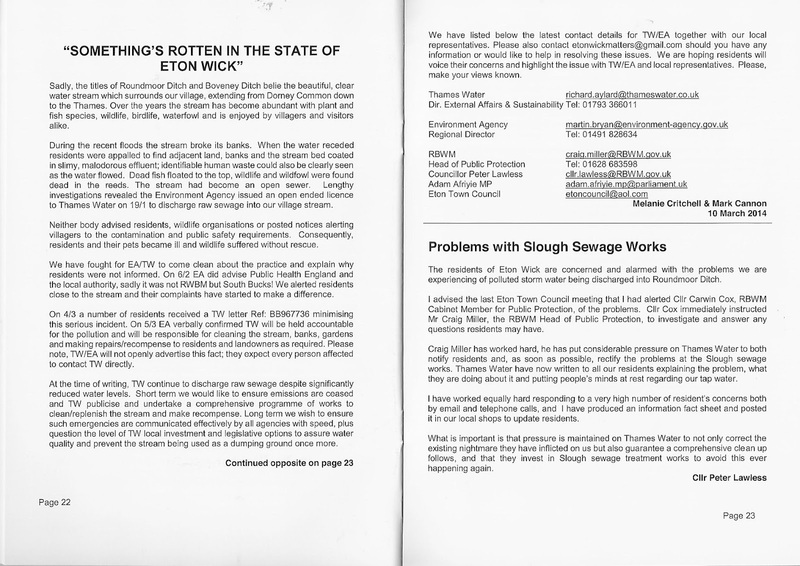 The letters were published in local and national papers and created quite a stir. Perhaps it was not surprising that the Church reacted in this way, for there was still much rivalry and intolerance nationally between the Established Church and the Nonconformists. Moreover, it was only three years since the Church in Eton had become separate from the College, and this was not a moment to welcome rivals. 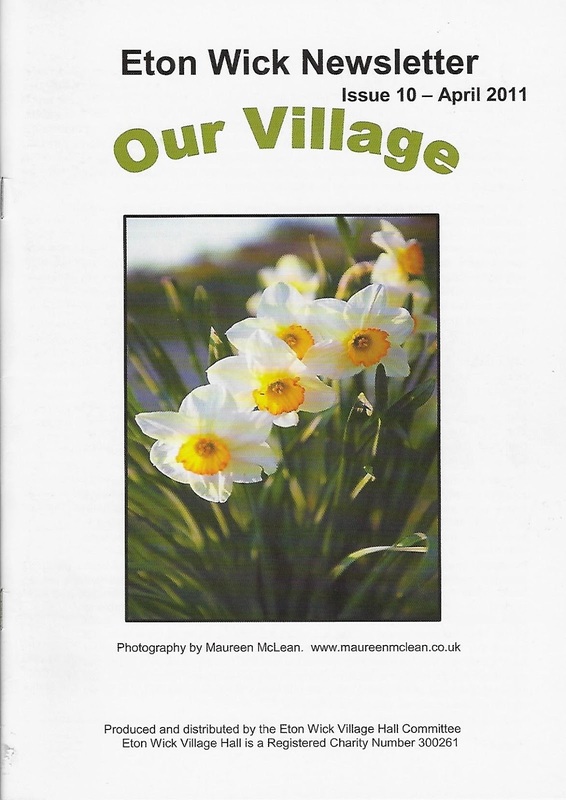 Undaunted, Mrs Tough continued her work and mission in the village. Hers was a very personal religion. She sought out those who needed her help to find the way to Salvation - even those who did not recognize the need but had found solace, or pleasure, in alcohol; beseeching, cajouling and encouraging them, until they returned. Nine years had to pass, however, before the Iron Chapel could be replaced by a new building. Until the development of New Town there simply was not any available building land. Even then it was only the persistence of Mrs Tough that won from the developer the small plot of land on which the present chapel stands. He gave it as 'a reward for perseverance’. The money was raised by subscriptions and, even though the chapel was small, no little effort was needed by the collectors. Eton Wick was still a relatively poor community and the rich of the parish were firmly Church of England. Within the chapel community were several people who are worthy of mention and whose names are recorded in stone on the walls of the chapel, but it is Mrs Tough who was known throughout the village. Her upright, forceful nature made her loved and feared. Even as an old lady she would wait outside the chapel until just before the service began to encourage people to come in. She died in 1930 and the Tough Memorial Hall was built in her memory.